When DigiTech first came up with the Whammy effect pedal, no one really thought it was going to become a staple of modern rock sound. Just like many new things back then, the consensus was that it’s a fad, a gimmick that will disappear as fast as it appeared in the first place. Well, those critics couldn’t be more wrong. Whammy went on to become one of the most important effect pedals in history of guitar effects, being used in over 60 Grammy awarded albums, and who knows how many legendary live performances. This is a two-in-one unit, featuring both an amazing tremolo and one of the most iconic octave effects . First hint that this pedal is not your average stompbox comes to you when you first see the Whammy. It looks more like a overly complicated wah pedal than anything else. It comes in red color, and features an LED cluster to the right of the expression pedal. These lights indicate which setting you are on, and which effect is selected. The layout looks complex, but is actually very simple. Five minutes with this pedal is more than enough time to get yourself familiar with the way it functions and where everything is. In terms of controls, there are three main elements. First and foremost, there’s the expression pedal. Next thing is your mode select knob which allows you to choose which effect you want to use, and which particular setting for that effect. Finally, there’s the Classic/Chord switch. This allows you to cycle between polyphonic and monophonic mode. Oh, and the whole thing is activated using a regular stomp switch that is fitted with a true bypass, so you can remove this pedal from the signal chain without suffering any changes in your tone. When it comes to performance, DigiTech Whammy is a force to reckon with. Both the tremolo and octave parts of its functionality are delivering high quality tone. The pedal works great and the controls are very responsive. This especially applies to the expression pedal. Some folks had issues with polyphonic mode, reporting that the pedal can’t really handle more complex riffs, however the consensus is that the fifth generation of Whammy handles things well way beyond anyone’s expectations. If a situation occurs where it can’t keep up with your playing speed, chances are you’re pushing it too hard. To put it in simple terms, there are two reasons why every guitar player should have one DigiTech Whammy in their collection. First, the pedal simply rules its segment of the market, and secondly it’s one of the most legendary effects pedals ever made. You are literally using a piece of history that some of the biggest names in the business used as before you. It’s not a cheap unit, but considering its nature and what it offers, we are tempted to say it is a bargain. If you want to take care of two good effects in one shot, this pedal is a perfect choice. 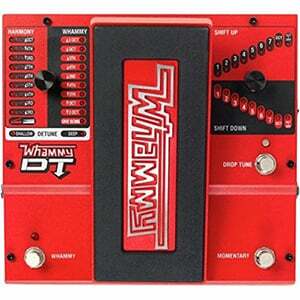 For more info about the DigiTech Whammy, click here.